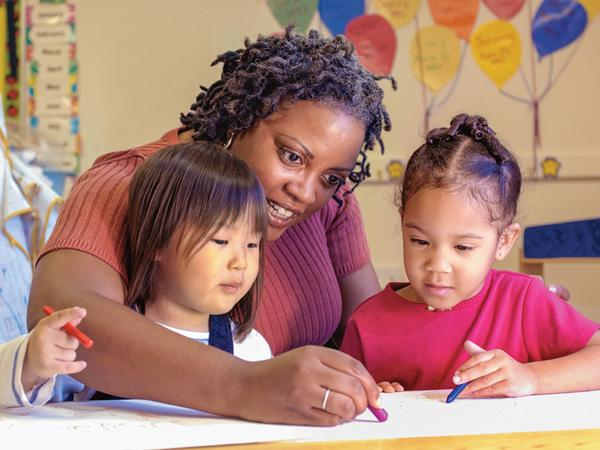 The Early Childhood Department consists of programs for children of 18 months, twos, threes, and Junior Kindergarten. The program offers children the opportunity to succeed in a nurturing, supportive environment. Our Early Childhood Department is in session for 212 days. together. The children display eagerness to learn and happiness in their achievements. They participate in all activities willingly, and are never pressured. All students are accepted on a probationary basis. A copy of the child’s birth certificate, health form, and proof of immunization, as well as registration fees, must accompany the registration application. School gives the young child the chance to spend time in a physical environment which is scaled to and planned for the child. The children can enjoy a wide variety of manipulatives, not only in the numerous toys that are offered, but also in music, books, and art. They can also play with a number of children their own ages and can increase awareness of the world that they are helped to understand.A child learns a great deal about personal relations in their associations with other children. Through play, a child is encouraged to learn. they broaden their world to include an adult who understands and accepts them with a friendship based on trust. A good school allows children to function where they are developmentally, and at the same time stimulate, but never force, them toward the next stage of growth. They are always encouraged in the development of basic values, a sense of curiosity, of resourcefulness, of achievement and responsibility at whatever level. Such growth takes place in an environment where a child has the help of teachers who are concerned about promoting growth in terms of their own personality.